A bat stowed away on the orange external fuel tank of the space shuttle Discovery during its March 15, 2009 launch. Thisstory was updated at 10:32 p.m. EDT. A small batthat was spotted blasting off with the space shuttle Sunday and clinging to theback side of Discovery's external fuel tank apparently held on throughout thelaunch. NASA hopedthe bat would fly away before the spacecraft's Sunday evening liftoff, but photosfrom the launch now show the bat holding on for dear life throughout thefiery ride. ? "Hedid change the direction he was pointing from time to time throughout countdownbut ultimately never flew away," states a NASA memo obtained by SPACE.com. "Infrared imagery shows hewas alive and not frozen like many would think ? Liftoff imagery analysisconfirmed that he held on until at least the vehicle cleared [the] tower beforewe lost sight of him." Officialsat NASA?s Kennedy Space Center in Cape Canaveral, Fla., where Discoverylaunched from a seaside pad, said the bat?s outlook after launch appears grim. 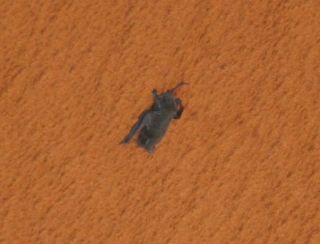 ?Based onimages and video, a wildlife expert who provides support to the center said thesmall creature was a free tail bat that likely had a broken left wing and someproblem with its right shoulder or wrist,? NASA officials said Tuesday. ?Theanimal likely perished quickly during Discovery?s climb into orbit.? Because the Kennedy Space Center is also home to Florida?s Merritt IslandNational Wildlife Refuge, NASA?s launch pads are equipped with severalcountermeasures, including warning sirens, to ward off birds and otherwildlife. NASA also relies on radar to make sure large flocks of birds won?t bestruck by the shuttle during liftoff. But the baton Discovery's tank did not budge, even after engine ignition. The bat was perched between one quarter and one third of the way up on the northside of the fuel tank, which is the side that faces away from the orbiter.NASA estimated the surface temperature of the tank at that location was between58 and 70 degrees Fahrenheit, even though the canister was filled withsuper-cold liquid hydrogen and liquid oxygen. In thehours before Discovery's liftoff, NASA's Final Inspection Team (called the"ICE team") investigated whether the creature would pose a riskto the shuttle if its body impacted the orbiter's sensitive heat shieldtiling. Ultimately, NASA officials signed a waiver confirming that the bat wassafe to fly with. "Thebat eventually became 'Interim Problem Report 119V-0080' after the ICE teamfinished their walkdown," the memo said. "Systems Engineering andIntegration performed a debris analysis on him and ultimately a Launch CommitCriteria waiver to ICE-01 was written to accept the stowaway." This isn'tthe first time a bat has attempted to travel into space. Another bat was seenclinging to the side of the external tank attached to the shuttle Endeavour onits ?STS-72 flight in 1996. That one maybe have been a bit more cautious,though: It flew away to safety right before launch. Coincidentally,an astronaut aboard that flight, Koichi Wakata of Japan, also flew on Discoverythis week, making him the first spaceflyer to share two rides with bats.Discovery's STS-119 mission is headed to the International Space Station todrop off the final segment of the lab's backbone truss and set of solar arraypanels. NASAofficials said a bat also set down on the external tank for the shuttleColumbia during its STS-90 mission in 1998. That bat also flitted away tosafety during liftoff, they added. SPACE.comis providing continuous coverage of STS-119 with reporter Clara Moskowitz andsenior editor Tariq Malik in New York. Click here for missionupdates and SPACE.com's live NASA TV video feed.